Porcelain paving is an increasingly popular choice in landscaping projects and Bradstone’s Madera hopes to push the appeal still further. Professional Builder’s Lee Jones visits an Oakley Landscaping job in Tonbridge Wells to find out more. A landscaping firm in the county affectionately known as the ‘Garden of England’ is always seemingly destined to flourish and, judging from the quality of the finish in evidence from Daniel Dunford and his team at the site we visited them on, Oakley Landscaping is doing just that. 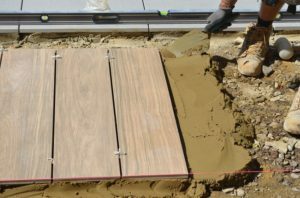 At the same time, the Richmond-based outfit were also demonstrating that one product in particular has become the aspirational paving selection amongst homeowners. Whilst the geology of the nearby Sussex High Weald might be dominated by sandstone, for the owners of the substantial properties of this affluent spa town, porcelain is now the material of choice and Bradstone is fuelling the trend by offering an extensive range. 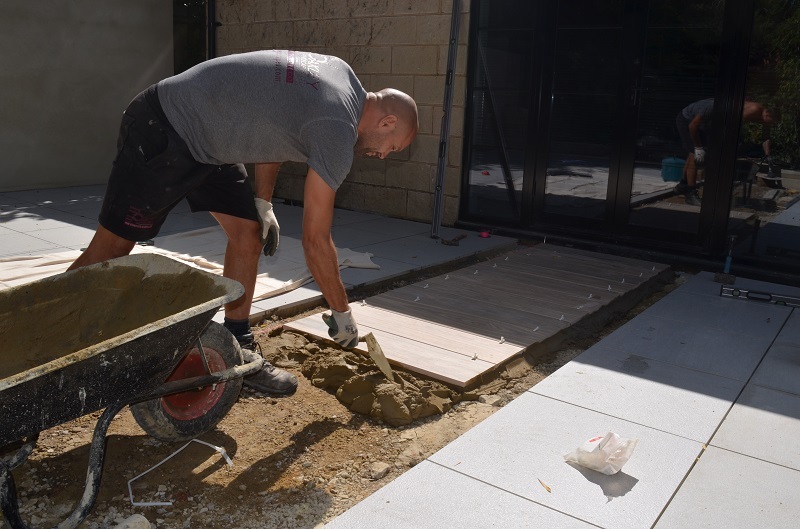 In recent years it has become an increasingly popular alternative to natural stone, but the introduction of the company’s Madera paving slabs means it can now challenge the aesthetics of other traditional landscaping designs. Available in either Birch or Oak shades, Madera is manufactured to provide a remarkable resemblance to timber but without any of the maintenance issues associated with that material. Indeed, at this particular site that is an attribute ably demonstrated by what the newly installed paved area had replaced – an expanse of softwood decking that had rotted to the extent of being a safety hazard. So where does Madera score highly against its wood decking counterpart? In the first instance, an anti-slip finish means it is impervious to the vagaries of the great British climate, remaining consistently safe underfoot whatever the weather. In fact, because it is fired at 1,400°C, the raw material is converted into a very dense and hard material, which gives porcelain an inherent durability and strength which timber can’t match. One of the beauties of porcelain is that, at the manufacturing stage, you can print virtually anything you like on it, which is why it has become such a versatile solution in today’s modern and design led outdoor spaces. The Madera slabs on this job were providing a feature path towards and around the clients’ extensive indoor pool and games area. 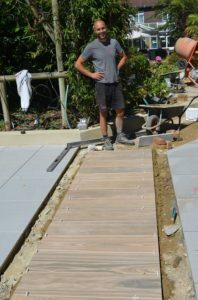 Just as in laying a patio, a 50mm thick bed of 4:1 mix of half sharp, and half soft sand, is trowelled onto a Type 1 compacted base, with the 900mm x 225mm plank-sized Madera paving then positioned on top. 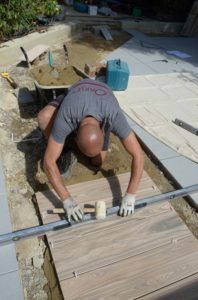 Where porcelain paving differs is the painting of a SBR Slurry Adhesive onto the complete extent of the back of the porcelain plank – and the tiling comparison doesn’t stop there: “You also need to make use of spacers to achieve the perfect finish,” continues Daniel. “When it comes to the paving that’s available right now, my van is full of samples and, of course, it’s all down to the client’s personal choice ultimately – but my next three or four jobs will be porcelain, which is an indication of just where it’s at with consumers. “Madera comes in at around £65-£75 per square metre so, unless you’re talking about very high end hard wood decking it’s a premium choice, but often people can be swayed by what you’ve done previously. Established as a company in 2000, Oakley Landscaping are also members of Bradstone Assured – a national network of professional garden and driveway installers each of whom has been the subject of a rigorous selection process before acceptance. “The scheme has been very good for us,” declares Daniel. “There’s a lot of competition in landscaping so anything that can give you a professional edge has to be welcomed and we also have access to a lot of marketing support as well. To apply, complete this simple online form and Bradstone will send you an application form immediately. A safe solution for paying and being paid for home improvements. As a member of Bradstone Assured you have unique access to Bondpay, a system that allows you to see pledged funds for the project deposited into a secure holding account by your customer so that even before you commence work, you know the money is there to pay for the project. When the work is completed, an additional Bondpay warranty will protect you for the next 12 months. The process is registered with the Financial Services Authority (FSA) which means any money deposited is completely protected. Any person who loses money where an FSA registered firm fails is entitled to up to £85,000 of compensation from the Financial Services Compensation Scheme. For further information on Oakley Landscapes click here. For further information on Bradstone click here.